In stock - low quantity. Order in the next 3 hours, 10 minutes and it will go out today! This is a GREAT beginner illusion! Performed by magicians worldwide. The magician tells a story of an Egyptian king who hated magic and asked that the magician be given a taste of his own medicine. Acting as part of the magician a spectator is chosen from the audience. 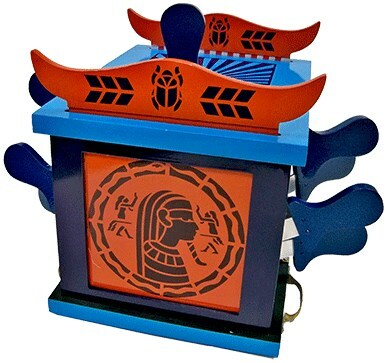 The "magicians" head is placed into the Egyptian box. Daggers (swords) are then placed into the box in all directions. The doors of the box are opened to display the condition of the magicians head. However the audience is shocked to find that the magicians head has VANISHED completely!!! The door is shut; the daggers are taken out to find that the "magicians" head has reappeared back onto his shoulders!